Man and woman, in lines. Become one with the form. Diana wears total look by SYLVIA CALVO BCN. It is from the new Collection “Barcelona t’estimo” made from recicled coffee sacks and organic cotton. Sandals by SUELA SHOES stand out for their ultra lightweight cork soles, their modern design and the natural materials. Esther wears jacket Carol, manually made by SYLVIA CALVO BCN. The dress is by GREATHICAL, both available at THE CIRCULAR PROJECT. It has been embroidered with nañunties. Diana wears Tilly dress by MAGAN BARCELONA. With an oversize look in 100% organic cotton and with GOTS certification, it is available in 12 colors. The shoes Pia are by SUELA SHOES with vegetable-tanned mule leather and bio-padded lined without chrome or cadmium, manufactured responsibly in Spain. The unisex backpack from the "Passion Wool" collection by D-RAÍZ stands out for its Zero Waste pattern. It is customizable: you can choose the color of the outer pockets and the stitching. Africa (standing) wears timeless dress by D´TALHES. It can be customized, choosing different overlayers dyed by hand in peach color that can be fixed to the garment by coconut buttons. The summer jacket Dina Z by MAGAN BARCELONA is 100% organic cotton knitwear, GOTS certificated. It is available in 12 colors. 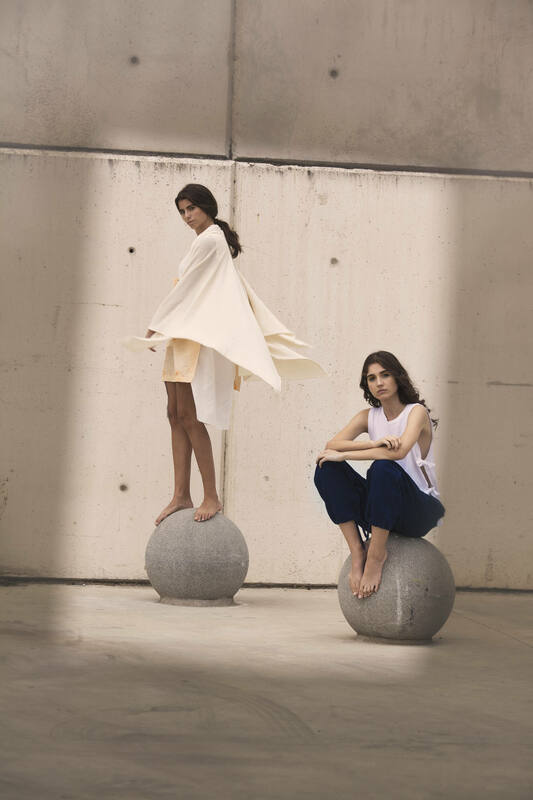 Esther (sitting) wears top Niza by MAGAN BARCELONA. It is a thin 100% organic cotton vest with GOTS certification, available in 12 colors. The pants are from KINGS OF INDIGO. Diana wears a draped dress, Summer Sam, from BIOCRACIA. It has been modeled by the designer directly on mannequin using an organic cotton jersey fabric whose yarn has been previously dyed with the Indigofera Tintórea plant to provide the blue color. Clunch Muscari by ARACELI GARCIA ILLUSTRATION, with 100% cotton canvas fabric digitally printed in Limited Edition to 50 copies. Dress and bag are available at THE CIRCULAR PROJECT. 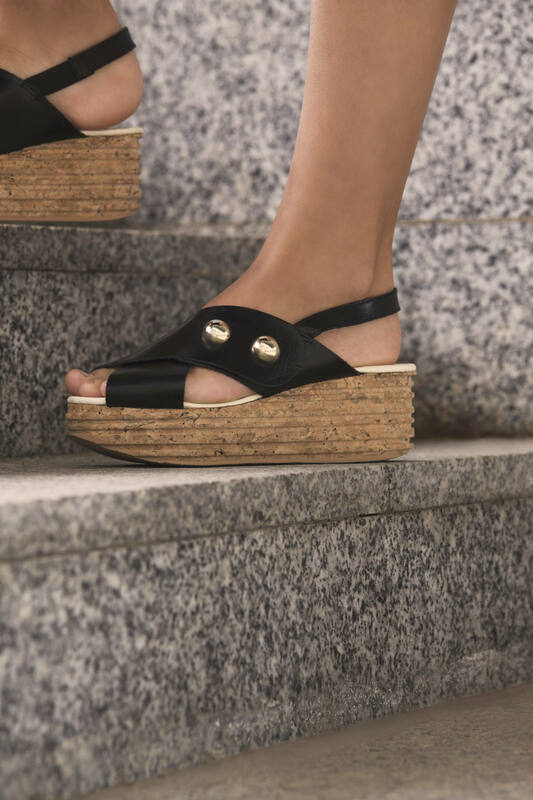 The sandals Emma by SUELA SHOES are made with wedge made of natural oak cork with vegetable tanned bio-leather and chrome-free linings, manufactured responsibly in Spain. Africa wears "Two in Blue" Eco kimono 3.4 by AVASAN. Jeans Blue pleaded antelina lined in purple cotton, from Spanish stock textiles. It has been hand embroidery in Moscow. It is a unique piece. Top is a swimwear by KORUSWIMWEAR. Jeans are made by KINGS OF INDIGO. 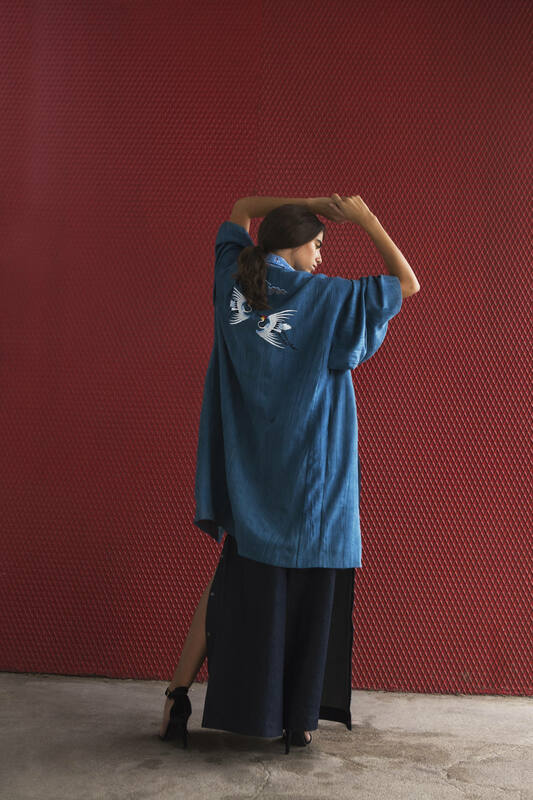 Esther wears kimono Sese by MAGAN BARCELONA. The Maxi long thin cardigan by MAGAN BARCELONA is made out of 100% viscose. It is available in 8 colors. The dress is vintage, stylist’s own.